The Arabs call these sprouts 'the father of all foods'! Sprouts are fortified with good amounts of nutrients making it a super healthy food. 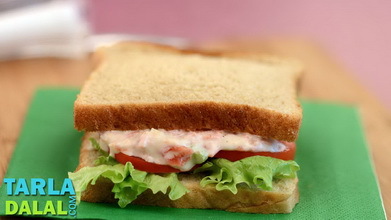 This sandwich cuts down on the second slice of bread, as it is an open sandwich. 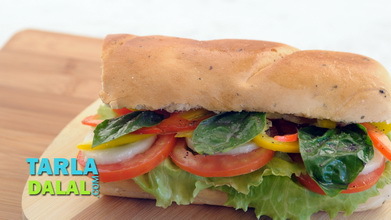 Colorful peppers, olives, sprouts, tomato and cheese baked on a footlong make it an extremely tasty meal! 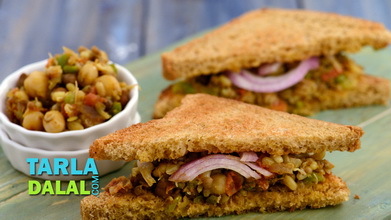 To make the Alfalfa Sprouts Open Sandwich, pierce the yellow capsicum with a fork, brush it using ¼ tsp of olive oil evenly over it and roast it over an open flame till it turns black from all the sides. Cool, wash it in cold water and remove the skin, stem and seeds and discard them. 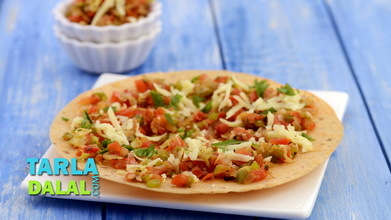 Cut the capsicum into thin slices and keep aside. Repeat steps 1 and 2 for red and green capsicum. Combine the roasted green, yellow and red capsicum slices, remaining 1½ tsp of olive oil, salt and a little pepper powder in a bowl and mix well. Divide the capsicum mixture into 4 equal portions and keep aside. Cut the footlong bread into 2 pieces from the centre and then cut each piece into 2 halves horizontally. You will get 4 bread halves of 6” each in all. Place all the 4 bread halves on a flat, dry surface and core the inner side of each halve so as to form a slight depression. Spread ¼th of the marinade evenly on each bread halve. 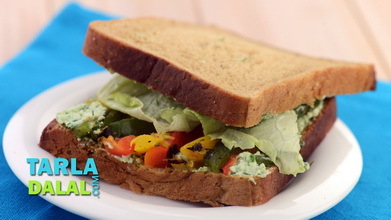 Place a portion of the capsicum mixture in the depression of each bread halve and arrange 3 tomato slices over it. 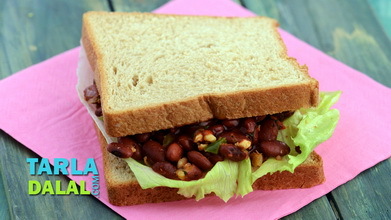 Place 1½ tbsp of alfa-alfa sprouts and ½ tbsp of black olives evenly on each bread halve. 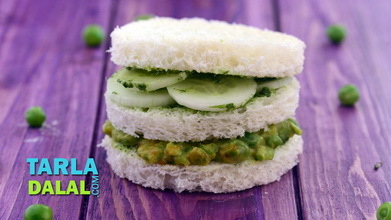 Sprinkle ¼ tsp of oregano, a little salt and ¼ tsp of pepper powder on each bread halve. 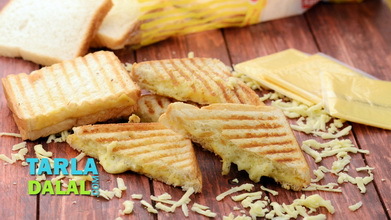 Top each bread halve with ½ tbsp of cheese and bake them in a pre-heated oven at 200°c (400°f) for 8 to 10 minutes. 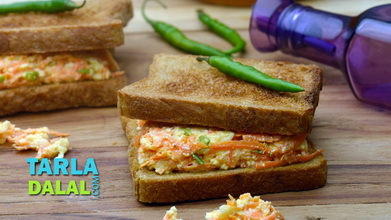 Serve the Alfalfa Sprouts Open Sandwich immediately.